Simon Kemp has been featured on four previous episodes of this podcast: #022, #048, #104, and #125. He is best known for his annual Global Digital Reports, as well as his regional reports and country reports – all of which he produces in collaboration with Hootsuite and We Are Social. These reports provide detailed and up-to-date information on how people around the world are using the Internet in general and social media in particular. Originally from Scotland, Simon has been living in Singapore for over a decade now. He is the Head of Kepios, a global marketing consultancy that helps brands make sense of the future. All of Simon’s reports, which he has been publishing since 2011, are now available free of charge via DataReportal.com. This new online reference library represents an invaluable resource for marketers and business owners who are planning their international strategies. Catch Simon’s key takeaways from the Digital 2019 report, and send him your comments or questions via the Verbaccino Contact page! 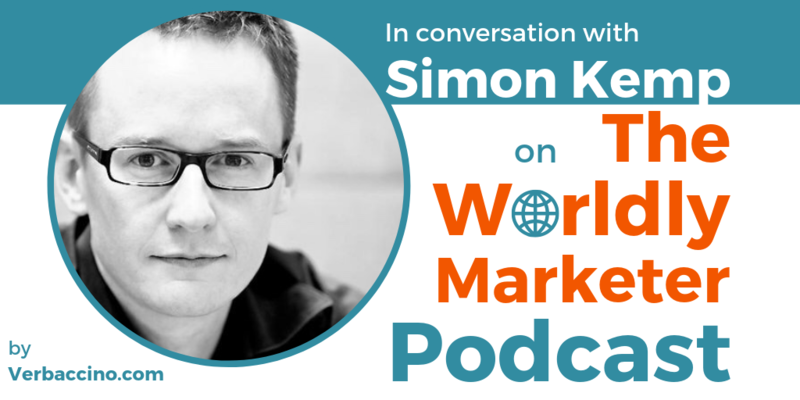 We’ll make sure to have Simon back for a follow-up interview on a future episode of The Worldly Marketer Podcast.